These days, when you hear people speak of what separates one company from another in their space, they often say ‘the people.’ But how do you back that up? When I think about the provenance of the INFINIDAT team, the first thing I think of is a team of people that probably has had a hand in developing a majority of the storage systems that are deployed in data centers across the world today. Even if they didn’t develop the specific array, they developed something that is a part of a patent that is in the array. This team knows storage. Our history in storage development starts with our CEO, Moshe Yanai, who began his career at Control Data Corporation programming disk controllers for MP17 computers via punch cards and possibly riding a dinosaur to work. Then in 1987, Moshe joined EMC and developed the Symmetrix storage system. During Moshe’s tenure as the leader of the Symmetrix division, EMC was famously characterized as one of the “four horsemen of the new economy,” catalyzing the industry’s transition from the IBM Mainframe era to the Internet era by enabling terabyte-scale databases powered by Symmetrix and low cost open system server technologies. He built the team from just a few people to over a thousand, and their technology truly moved the state of the art forward. If your company mattered in the late nineties, the foundation of your application stack was almost certainly an Oracle database running on an E10K sitting next to a couple of Symmetrix arrays. Those were the days. In 2001, a number of engineers who worked with Moshe followed him, as Moshe puts it, to the first storage company he founded after coming out of retirement (the first time) called XIV Storage. XIV had an innovative distributed RAID implementation and cool architecture, and it was when I first had the pleasure of getting to know many of these brilliant, crazy developers. They built the system, grew the company, and sold it to IBM in 2007. Moshe then left IBM and he retired again. 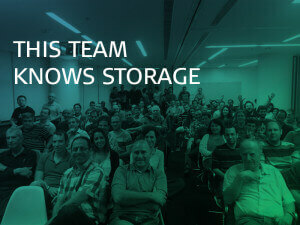 In 2011, Moshe came out of retirement again (for the last time), to build a next generation storage company, INFINIDAT. Not because he needs the money or because he can, but because in his investment work in healthcare and life sciences, he was being told over and over again that the cost of storage is holding back the scientific mission, and he wanted to do something about this. So now, a group of developers who have had their hands in defining what we know as the modern storage industry is taking everything they have learned and everything they know and applying it to build a new platform that can move the state of the art forward again. These are people who invented many of the core storage protocols and algorithms in your systems today. You know these people. They know you. They know how you use storage. They know what matters and they care. And it doesn’t stop there. 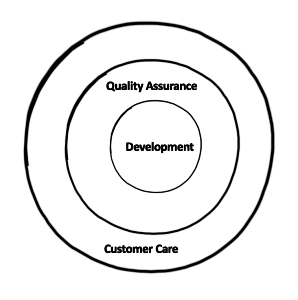 Quality Assurance (QA) in most companies is often an afterthought. Once a feature is developed, testing is typically left to the 2nd tier of development, kind of like when the worst guitar player in your band gets demoted to bass (or a roadie gets promoted), and you now have a sloppy rhythm section and are a trainwreck on stage. Not at INFINIDAT (that’s Rotem, our team leader for infrastructure development, by the way). Forget about vocalists. Your band is only as good as your rhythm section and your software is only as good as your QA team. The next step in building a successful company was to develop world class support from day one. Our philosophy here is a combination of automation and human touch. First, our systems in the field are highly instrumented and stream health-related telemetry to our support center. We’ve built a sophisticated data science infrastructure that analyzes health data of the global footprint at scale in real time, detects anomalies, and alerts us if any component in any customer system is falling out of tolerance. This topic alone is probably worthy of its own blog post, but suffice it to say, if there is an anomaly in your system, we almost certainly know about it and will contact you with a fix long before availability of a service would be at risk. Another issue we’ve addressed is phone support. We hear so many horror stories from customers around terrible telesupport from the incumbents. You call multiple times, and talk to different people each time, few of whom are real engineers, and problems take forever to solve. This is what happens over time when vendors treat customer care as a cost center rather than a source of competitive advantage. For us, customer care is not a distraction from the mission, it is the mission. When you call INFINIDAT with a question, you will speak with a real engineer who, if you’ve got a really interesting question, is looking at source code while you chat. If they don’t know the answer to your question, they will conference in the developer or product manager who owns that part of the system to answer your question. Our philosophy here is to treat customers as extensions of our own system engineering team and ensure there is nowhere for information to hide and that we never drop the ball. The final aspect of our support system is our Technical Advisor (TA) program. Every customer is assigned a TA who is your project manager for all post-sale activities. They may draw a paycheck from INFINIDAT, but they work for you. They know your environment and act as your advocate inside INFINIDAT. We hear that some vendors charge for this service, but we do not. Our systems are so reliable, the cost of supporting them is much lower than the competition. And we invest those savings back into the business by offering the TA program at no additional cost. It’s an honor and a privilege to lead a passionate team and work alongside industry legends. As an example, I was thinking about ethernet protocols recently and popped into Efri’s office for his opinion on the project because he knows a thing or two about iSCSI. How cool is that? I bet this is what it felt like to walk the halls at Berkeley or Bell Labs back in the heydays. From product to design, and UX to core development thru to support, this is an impressive group of individuals, and it starts with our boss. Moshe has built a team that cares about one another, as well as the mission. We have very ambitious goals for the coming decades, but when you have a team like this, anything is possible.